Meet Linda Facci who among other things is a designer, felt animal artist, blogger and maker of the cutest stop motion video series I've ever seen. (Go check out all of her haunts for more great ideas!) We met earlier this year and I'm her newest devotee. So when she volunteered to share some Halloween goodness with us, I couldn't have been happier. 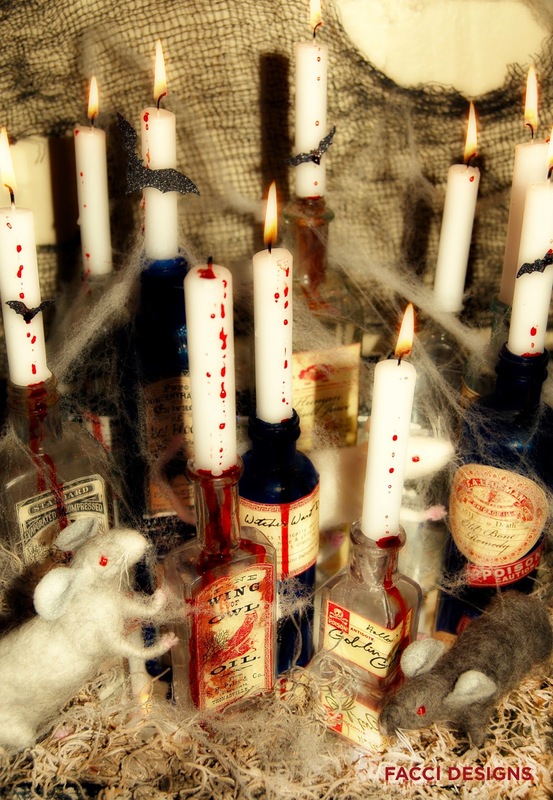 Apothecary jars and bottles, especially around Halloween, always seem to conjour up creepy 18th century pharmacists in the back concocting their potions, liniments and elixers. 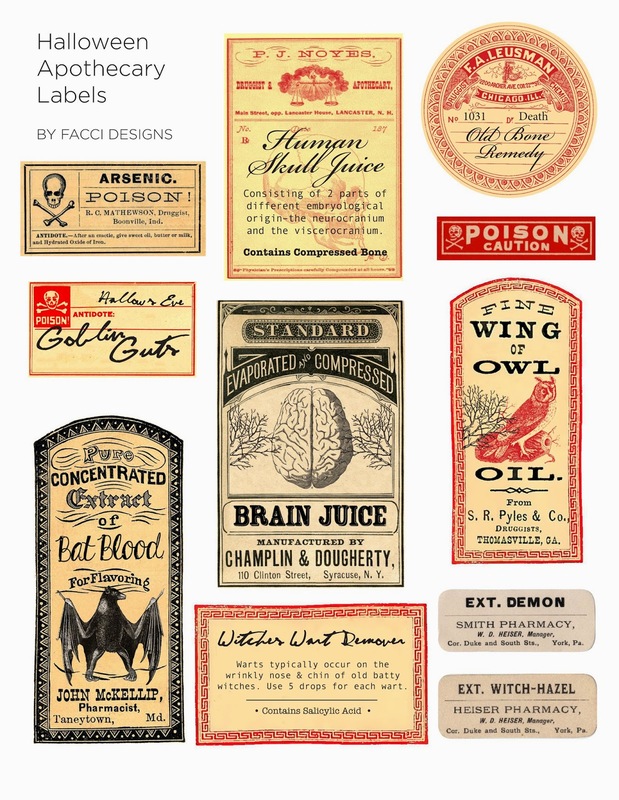 So to get into the spirit of Halloween, Linda created this wicked and spooktacular centerpiece with custom Apothecary printables. Linda used her own vintage collection of bottles but you can use bottles and jars you have in your kitchen or bathroom - try to find all sorts of heights and shapes for a more dramatic effect. You could also purchase several kinds of bottles online. She placed the netting on the table and secured part of it to the wall behind the centerpiece. 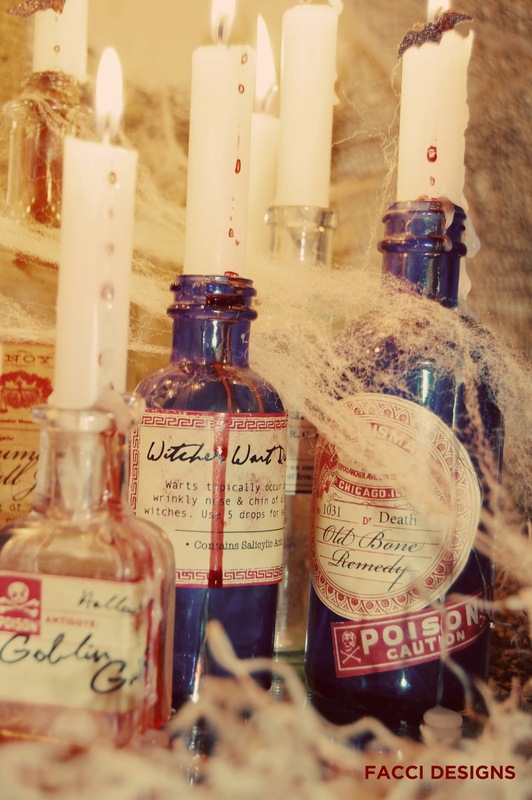 She then grouped the bottles on a mirror to create a ghoulish glow when the candles are lit adding moss and Halloween cobwebs. She printed her labels on an Avery White Full-Sheet Label but you could print on regular paper, trim and glue to your bottles. Don’t always center the label on the bottle, place some on the top, bottom or angle them a bit to make them look more authentic. Linda used Hanukkah candles since they are smaller and more narrow than your average candle. 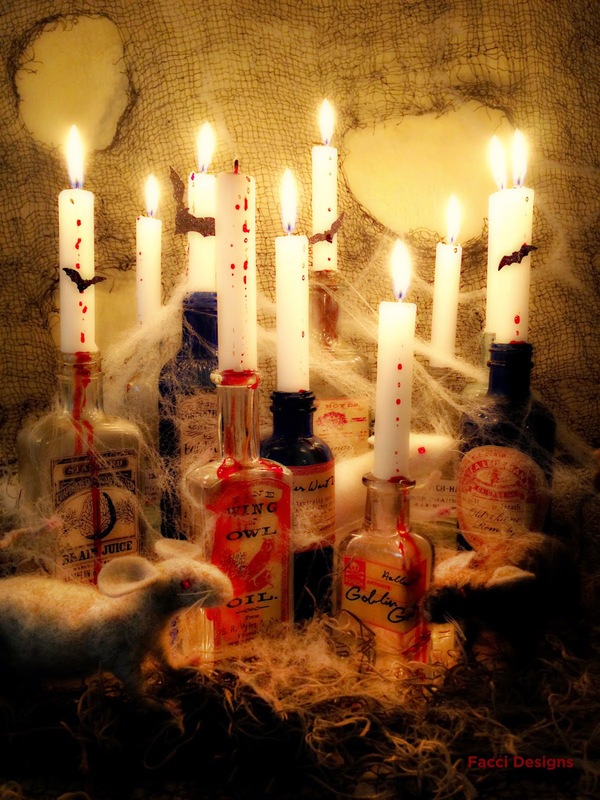 Once everything was set up, she dripped Halloween blood onto the candles and even some of the labels (Don’t worry if you get a fingerprint on them, it makes it look even creepier) and then adhered paper bats. Please note: when using real candles, please be cautious of the flame and keep the webbing away from the lit candles. Love love love! Thank you both so much for the download! Thank you Victoria and you're welcome Ian's Girl!!  Thanks to Brooklyn Limestone for featuring my project. Love them, my family thanks you! !